Gloves can be a fantastic accessory to your wedding ensemble and add elegance and flair to your whole outfit. Gloves are not as common, but for the bride who loves to stand out and make a statement gloves are a great way to achieve that objective. They bring an air of glamour to the gown, and work wonderful with theme weddings, such as a 40s wedding or Hollywood wedding. There are a few different styles of glove length, depending on the style of gown you have and the style of your wedding as well. Gloves can be worn by both the bride and the bridesmaids. A bride may choose one length for her bridesmaids and wear a different length herself to set her apart from her bridal party. Another option is for the bride to wear gloves that match her gown, and the bridesmaids’ gloves can be in the color of their dresses. Using gloves as a wedding accessory is best suited to indoor weddings or wedding in cooler seasons since they can make it a bit hotter for the bride and bridesmaids. Wrist length gloves only cover the hands and end right at the wrist as their name suggests. This length is good for simple elegance and look good with long sleeve gowns. A bride can choose to wear wrist length gloves even if she has a dress with short or no sleeves, but typically it will look better to wear them with a sleeve. The color of the wrist length gloves can either be the same color of the dress or a bride can also choose to have the gloves the same color as her groom’s tie or the bridesmaid’s dresses. Wrist length gloves in just lace can be beautiful as well. The elbow length gloves end just above or just below the elbow. This style of glove works well for a more formal day an evening wedding. 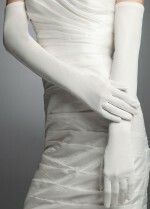 This glove length works better for a bride with slimmer arms due to the attention this will draw to the upper arm. It’s perfect for the bride who wants to show off her arms and like the wrist length, can be the same color as her gown or a contrasting color for more a dramatic effect. The elbow length glove looks best with a cap sleeve or short sleeve gown and will even compliment a short dress length. The fanciest and most dramatic of the three glove lengths is the opera length glove. This glove extends all the way up the arm to the top of the bicep. 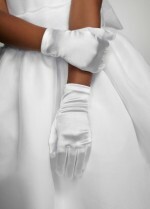 The opera length glove is perfect for a very formal wedding, whether day or evening, and looks best with a strapless or any style of sleeveless dress. This will give the bride a feeling of still being somewhat covered, despite the more revealing style of her gown. For the opera length glove, matching the dress would look the best for a more uniform look unless her gown has color on it as well, such as a colored sash, or print of some kind.